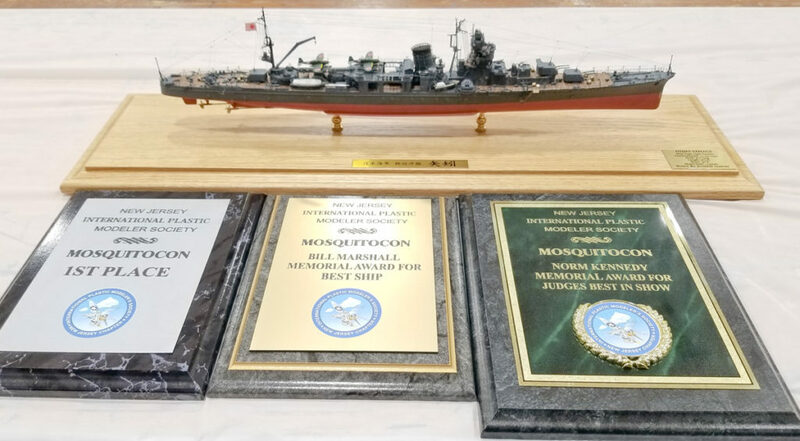 Contest Results for MosquitoCon 27 have been posted. Click HERE for the full list. The Best Of winners are below, along with some photos. The entire batch of photos will be posted in the near future. Thank you again to everyone who made MosquitoCon 27 a great success. It goes down as our third largest ever. We look forward to seeing you all again next year, Saturday April 6th, 2019! MosquitoCon 27: Thank You All! Best of Show went to Joe Simon’s amazing Japanese cruiser Yahagi. More photos of this, the other winners, and of all the models entered to follow, as soon as we can get them processed and sorted. We have a forecast of possible snow on Saturday morning. There’s little to no expected accumulation, though, and most of it should be gone by noon. The show will go on as scheduled. We had reports of issues with digitally filling out information on the contest registration form. We tested it and sure enough, it was broken. A new contest registration for has been uploaded HERE, and is also available on the MosquitoCon 27 page.